Students often ask, 'What tool do I need? ', as if a tool only does one cut. 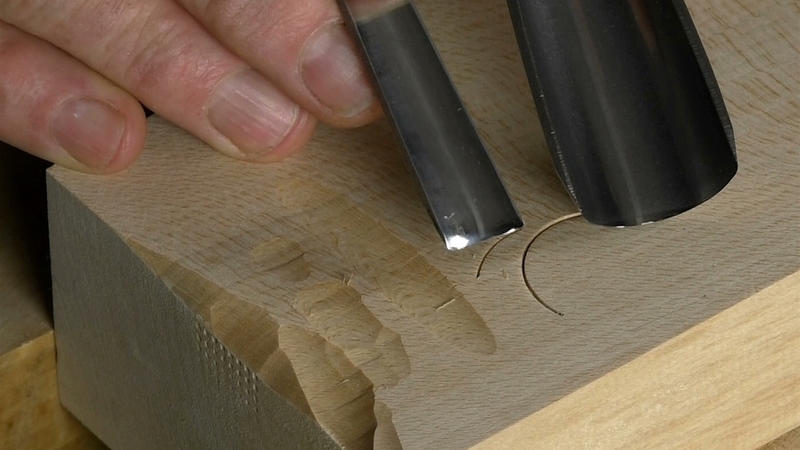 Sometimes an exact cut is what you need but mostly that precision is not what you need to be thinking about. Here's the thing: Any tool can make a whole array of cuts, will have different 'outcomes' depending on how you handle it. If you look around the projects on Woodcarving Workshops, you'll see me continually adjusting the tool according to what I'm trying to do - and I hardly know I'm doing it. In this summary workshop I will take a simple, common tool (#6 x 1/2in. 14mm) and show you a variety of different outcomes and things to think about. You bought one cut? Think again! Get some wood and a similar tool, pause video at any point - and play. Play. Get to know your tools. You need to be so familiar with them that they become extensions of your hand. Charles - I've checked the video on various browsers and machines and it's working fine and not stalling at all. So I don't think it's a problem website-end. Try clearing your cache and reloading the page? Any one else have a problem? This particular video stalls out intermittently and at 1 min 31 seconds it comes to a complete halt. I have run it twice with the same result. Comment ? John - It's a little out of my field here; I would usually carve something and leave the issue of fixing and staining to the restorer. I believe normally appliques are fixed with glue and/or discrete pins to a naked or 'keyed' wood surface. Whether the staining is done before or after, or both, is moot. I would guess before certainly then a touch up once the piece is in position with all the surrounding colour and patination.